London's airports will hit full capacity six years sooner than expected, new government figures say. Without expansion, the five airports will be full by 2034 because of higher demand for flights, according to the Department for Transport (DfT). It made the estimate as it extended the consultation period for expansion at Heathrow by two months. 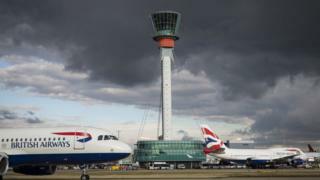 Transport Secretary Chris Grayling said the case for building a third runway at Heathrow was "as strong as ever". The new estimate on airport capacity will help to fuel calls for expansion at other airports in the South East. Gatwick reiterated its pledge on Tuesday to build a second runway regardless of what happened at Heathrow. The DfT has published a series of new reports into the impact of expanding the UK's biggest airport, including updated noise analysis and a new air quality plan. A consultation on the draft Airports National Policy Statement, which sets out the government's support for the Heathrow project, initially closed in May, but it has now been reopened until 19 December.